How Does Medical Acupuncture Work? Is It Safe? Dr. Sciammarella graduated from American University of the Caribbean in June, 1985. He is a Diplomate of the American Board of Internal Medicine, and the American Board of Emergency Medicine and has practiced Emergency Medicine for 25 years. Does medical insurance pay for accupuncture? Acupuncture is just one of the elements that make up the discipline often referred to as traditional Chinese medicine. Traditional Chinese medicine, or TCM, is a combination of physical, mental, and spiritual practices that include techniques such as massage therapy and acupuncture, along with herbal medicine and various forms of mind-body exercise such as Daijiquan (Tai Chi Chuan) and Qigong (Chi Gong). In many states, licensed acupuncturists are independently licensed health-care practitioners. In some states, physicians who obtain additional training and qualification in acupuncture are allowed to perform acupuncture within the scope of their license to practice medicine. The term medical acupuncture is used to denote the practice of acupuncture performed by a licensed physician. The state requirements for the practice of acupuncture vary. Be sure that any practitioner you visit has met the requirements for your state. The earliest known source of information on acupuncture is a text called the Huang Di Nei Jing, or Yellow Emperor's Inner Classic, which is believed to have originated as early as the second century BC. The Nei Jing regarded the human body as a miniature representation of the universe as a whole and taught that a state of health could be achieved by balancing the body's internal environment with the external environment of the entire universe. The earliest European reports about acupuncture came from Jesuit missionaries in the 16th and 17th centuries. In fact, the word acupuncture was coined by French Jesuits, from the Latin acus (needle) and punctura (puncture). Although it has been widely believed that this represented the earliest European introduction to acupuncture, acupuncture may have actually been a practice familiar to ancient Europeans. The mummified remains of the so-called Austrian Iceman, who has come to be known as Oetzi, were found in the Italian Alps in 1991. The mummy is believed to be over 5,000 years old. A series of tattoos was discovered on Oetzi's body, which correspond to the locations of traditional acupuncture points still in use today. It has been suggested that these ancient Europeans might have been aware of the practice of acupuncture earlier than had previously been thought. In the United States, accounts of acupuncture began to appear in the medical literature in the mid-1800s. In fact, Sir William Osler included a section on the use of acupuncture for the treatment of "lumbago and sciatica" in his respected textbook The Principles and Practice of Medicine from 1892 through its final edition in 1947. The 1901 edition of Gray's Anatomy included this statement: "The sciatic nerve has been acupunctured for the relief of sciatica." A turning point in the introduction of acupuncture in the United States came in 1971. James Reston, a reporter for The New York Times, was in Beijing to report on a ping-pong match between China and the United States. While there, he developed acute appendicitis and required an emergency appendectomy. The report of his firsthand experience with acupuncture for the management of his post-operative pain was published on the front page of The New York Times. This sparked an intense interest in acupuncture by the public. Several months later, a report favorable to acupuncture was published in the Journal of the American Medical Association. In 1987, a major step forward in the acceptance of acupuncture by Western medicine occurred with the founding of the American Academy of Medical Acupuncture. The AAMA became the sole physician-based acupuncture society in North America. It is estimated that, by 1991, 8,000 nonphysicians and 1,500 physicians were practicing acupuncture in the United States. An article published in the prestigious New England Journal of Medicine in 1993 by David Eisenberg, MD, and colleagues reported that $14 billion were spent by Americans in 1990 on "alternative therapies." It was becoming apparent that the public was embracing complementary medicine. In 1992 the Office of Alternative Medicine was created within the U.S. National Institutes of Health. In 1997, the office convened a Consensus Development Conference that resulted in the publication of a Consensus Statement affirming the benefit of acupuncture for certain medical conditions. These conditions included postoperative and chemotherapy-induced nausea and vomiting, postoperative dental pain, substance addiction, stroke rehabilitation, headaches, menstrual cramps, tennis elbow, fibromyalgia, osteoarthritis, low back pain, carpal tunnel syndrome, and asthma. A significant development in the acceptance of acupuncture in the United States occurred in 1996, when the U.S. Food and Drug Administration reclassified acupuncture needles from the Class III, or "investigational" category, to Class IIb, the category that means "safe, effective, but with special restrictions." By no longer being considered investigational, acupuncture moved forward toward medical legitimacy. In 1998, the Office of Alternative Medicine was expanded to become the National Center for Complementary and Alternative Medicine (NCCAM). The NCCAM is one of the twenty-seven agencies that are part of the National Institutes of Health. One of NCCAM's major goals is to research and present information on complementary medical systems under rigorous scientific practice. Another first in Medical Acupuncture occurred in April of 2000, with the establishment of the American Board of Medical Acupuncture. The board offered its first certifying examination for physicians in October 2000, allowing physicians the opportunity to demonstrate proof of proficiency in the specialty of medical acupuncture. Physicians who pass the ABMA certifying examination are referred to as Diplomates of the American Board of Medical Acupuncture (DABMA) and are considered to be board certified in medical acupuncture. The ancient Chinese viewed all of nature as the expression of a universal, natural law called Tao ("Dao"). As described by Lao-Tze (the "Ancient One") in the Tao Te Ching in the 5th century BC, Tao is the force that creates all things in the universe. 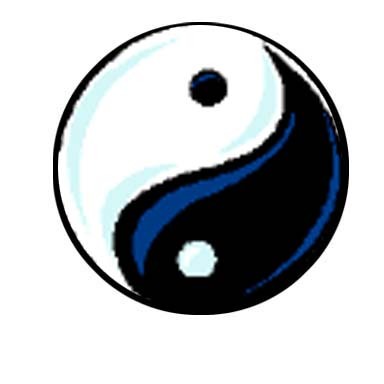 The Tao gives rise to the dual polarity of nature, embodied in the concept of Yin and Yang. Yin and Yang represent the two extremes found in nature. The original meaning of the term Yang, as reflected in its Chinese ideogram, is the sunny side of a hill. Yin, on the other hand, represents the shady side of the hill. The Yin/Yang convention is relational: there is no Yin without Yang; there is no Yang without Yin. There are both or nothing. Everything in the universe is a manifestation of the relative relationship between the polarity of Yin and Yang. If one end of a stick is designated Yin, and the other is designated Yang, breaking the stick in half yields two identical sticks, each with a Yin and Yang end. Yin and Yang cannot be broken apart. Nothing is permanently or absolutely Yin or Yang. On the body, the head is considered to be Yang with respect to the rest of the body, but the head is considered Yin when compared to the sky. This relational concept can be defined in terms of direction. No location is East or West by itself, without reference to another point in space. China may be East of Europe, but it is West of North America. Nothing can be defined without its reference point. The Tao creates Yin and Yang. The dynamic polarity between Yin and Yang produces the flow of a "life force" called Qi (pronounced "Chee" or "Chi"). Qi is omnipresent in nature, manifesting as change and movement. In the body, Qi accumulates in the organs and flows through a series of channels or meridians. According to traditional Chinese medicine, the flow of Qi in these meridians can become deficient, excessive, stagnant, or wayward. When this occurs, the symptoms of disease become manifest. It is believed that these conditions can be influenced and altered by the insertion of acupuncture needles into acupuncture points located along these meridians. The objective of acupuncture is to regulate and normalize the flow of the Qi in the body, so that Yin and Yang return to a state of dynamic equilibrium. Typically, 365 acupuncture points are described. However, today, the number of points has increased to nearly 2,000, in part due to the creation of "microsystems" such as auricular (ear) acupuncture and hand acupuncture systems. Since the 1970s, much scientific information has been gathered about the physiologic mechanism by which acupuncture works. Most of this research has been focused on acupuncture's ability to relieve pain. Early on, the placebo effect was dismissed as the main mechanism of action (a placebo means no active procedure or medication is actually given). Animals are not capable of demonstrating the placebo effect, yet, veterinary medicine uses acupuncture as an effective means of pain relief in the treatment of animals. Also, acupuncture pain relief is able to be blocked by certain drugs and reversed by administering the opiate-receptor antagonist naloxone. Both of these facts argue that a physiologic mechanism is involved in producing acupuncture pain relief. In addition to causing effects in the spinal cord, the nerve impulse produced by the acupuncture needle is also transmitted to the periaqueductal gray area of the mid-brain, where enkephalin is released. Enkephalin, in turn, brings about the release of the monoamine neurotransmitters serotonin and norepinephrine in the spinal cord. These monoamines play a role in suppressing the transmission of the pain impulse. In addition to its role in reducing pain, serotonin is involved in producing an antidepressant effect in the brain. In fact, many of the newest antidepressant drugs work by prolonging the effect of serotonin in the brain. A third effect brought about by acupuncture is the release of beta-endorphin and adrenocorticotropic hormone (ACTH) from the pituitary gland into the bloodstream and cerebrospinal fluid. The endorphins produce system-wide pain relief, remote from the area where the acupuncture needle was inserted. ACTH, in turn, activates the adrenal gland to release cortisol into the bloodstream. Cortisol is a naturally occurring steroid substance that has anti-inflammatory properties. The net result of these three areas being stimulated is an inhibition of the incoming pain sensation locally, a general, morphinelike, pain-relieving effect throughout the body, an anti-inflammatory effect, and a general sense of improved well-being. It is believed that the earliest acupuncture instruments were sharp pieces of bone or flint called Bian stones. 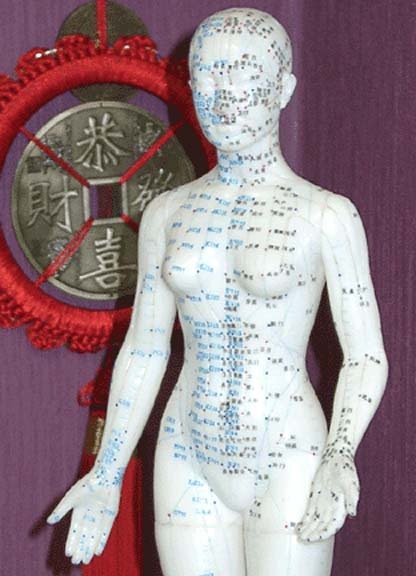 During the Iron and Bronze ages, metal acupuncture needles began to be developed. Early needles were made from iron, copper, bronze, and even silver and gold. Modern acupuncture needles are made out of stainless steel and come in various lengths and gauges of width. These acupuncture needles consist of a stainless steel shaft, with a handle made out of copper or steel. Some Japanese needles have a color-coded plastic handle. Unlike standard needles used for intramuscular injections, or for drawing blood, acupuncture needles are solid, not hollow, and have a finely tapered point, as opposed to a beveled cutting-edge point. In fact, acupuncture needles are so thin that an acupuncture needle can actually fit within the hollow of a standard blood-drawing needle. Acupuncture is essentially painless. Although some people may experience a slight pinch as the needle is inserted, many feel nothing at all. Once inserted, the needles remain in place for approximately 20-30 minutes. Because modern acupuncture needles are disposable and used only once, there is no risk of transmitting infections from one person to another. Acupuncture has relatively few, if any, side effects. The most common side effect from acupuncture is a feeling of deep relaxation and an increased sense of well-being. As with any puncture, a slight discoloration at the acupuncture site may occasionally occur. This is temporary and not dangerous. One published report documents the safety of acupuncture even when performed on people receiving the anticoagulant warfarin (Coumadin). Although adverse effects can occur if acupuncture is improperly performed, only 10 cases of internal injuries from acupuncture have been reported in the United States from 1965-1997. Although some insurance carriers have begun to reimburse for medical acupuncture, most do not. As of December 2007, Medicare still did not cover medical acupuncture. In some states, medical acupuncture is covered by workers' compensation and no-fault automobile insurance. Because of the variability in each policy, contact your own insurance carrier to determine if the company provides coverage for medical acupuncture. The traditional symbol of Yin and Yang, symbolizing the dual, polar nature of the universe. Click to view larger image. According to traditional Chinese medicine, Qi flows throughout the body along channels or meridians. Click to view larger image. An acupuncture needle placed in the 4th Large Intestine meridian point (LI4). Click to view larger image. 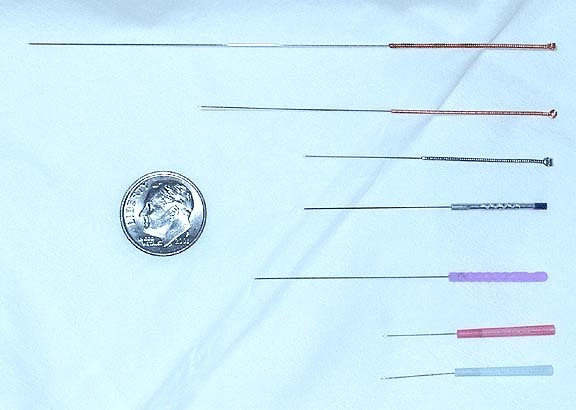 Modern acupuncture needles come in various lengths and gauges of width. Click to view larger image. 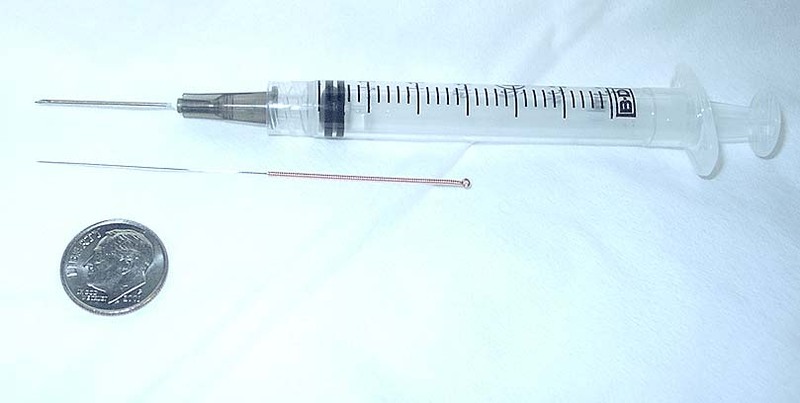 An acupuncture needle is shown next to a standard syringe and needle used for injecting medication. Compare the hollow needle with its beveled, cutting-edge tip, with the solid shaft of the acupuncture needle, which has a finely tapered tip. Click to view larger image. 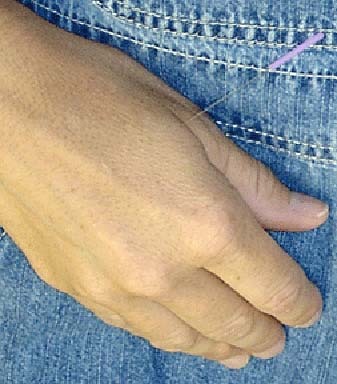 Acupuncture needles are so thin that they can fit within the lumen of a standard blood-drawing needle. Click to view larger image. Eisenberg DM, Davis RB, Ettner SL. Trends in alternative medicine use in the United States, 1990-1997: results of a follow-up national survey. JAMA. Nov 11 1998;280(18):[Medline]. Eisenberg DM, Kaptchuk TJ, Laine C. Complementary and alternative medicine--an Annals series. Ann Intern Med. Aug 7 2001;135(3):[Medline]. Eisenberg DM, Kessler RC, Foster C. Unconventional Medicine in the United States - Prevalence, Costs, and Patterns of Use. NEJM. 1993;328. Eisenberg DM, Kessler RC, Van Rompay MI. Perceptions about complementary therapies relative to conventional therapies among adults who use both: results from a national survey. Ann Intern Med. Sep 4 2001;135(5):[Medline]. Fugh-Berman A. Alternative Medicine- What Works. American Health Consultants. Baltimore, Md: Williams & Wilkins; 1997. Helms JH. Acupuncture Energetics. Berkeley, Calif: Theme Medical Publishers; 2007. Sciammarella J. Acupuncture in patients anticoagulated with warfarin. Medical Acupuncture. 2002;13(2). Sohn RC. Tao and T'ai Chi Kung. Rochester, Vt: Destiny Books; 1989. Stux G, Pomeranz B. Basics of Acupuncture. 5th ed. Berlin: Springer-Verlag; 2003. National Center for Complementary and Alternative Medicine. "About NCCAM." 29 Dec. 2007. http://nccam.nih.gov/. Did you receive medical acupuncture treatments? Tell us about your experience.